Kangaderoo Custom QR Code. 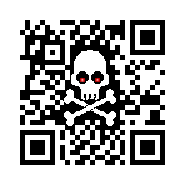 : QR Codes Placeholder for Viruses? I got a remark the other day that QR Codes were associated with viruses. This issue became such a big hurdle that there was no longer any interest in purchasing a QR Code. How big is this virus thread in QR Codes? Unless you have a computer for a brain the black and white squires of a QR Code will only reveal its content upon scanning. It could be a link to a site that is malicious. It could be a link to an unwanted application in a mobile store. It could be a pre-formatted text message to a paid service. For e-mail and QR Code both is that wrong can be done with the technology, and in this world that we live in someone is going to try. One of the reasons I started making Custom QR Codes with the possibility to apply branding in the code itself is to link the QR Code visual to your company. If a QR Code with a company branding is still associated with viruses you might have to wonder how well you company is trusted. If you are not afraid of QR Codes, and you require a fast scanning, error free QR Code, don't hesitate to contact me or visit my site to see more examples of what is possible with QR Codes.